Grosgrain: Overnightprints.com Free Business Cards GUEST GIVEWAWAY!!!! CLOSED. Overnightprints.com Free Business Cards GUEST GIVEWAWAY!!!! CLOSED. I know I've been meaning to get business cards for years....even when I didn't have any reason to have them. There's something exciting about seeing your name on a tiny piece of paper that I can't resist. If you too are also looking to create your own business cards or just personal calling cards take a look at this neat giveway. Overnightprints.com is offering one lucky grosgrain reader 500 free business cards. Upload your design online and your order is printed overnight. They print business cards, postcards, greeting cards, bookmarks, brochures, posters, letterhead, envelopes, stamps and more. Yay! I would love to win this one! i love overnight prints...they do great work! What a great giveaway! I also have been meaning to get business cards made, but it never happened- and I want to be able to swap them with others when they give me theirs! Business cards would definitely make me feel alot cooler! I'm in :) Candy and prize are great! I would like to enter the giveaway - thanks! Cool cards, I need some new ones too!!! Awesome! 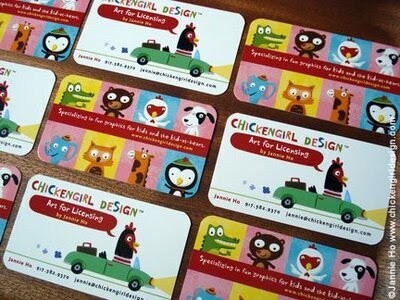 I love business cards and calling cards!!! Love the images on the giveaway post! I found your blog through While They Sleep's blog and I would love to win some business cards. I was just about to order some! What a great giveaway. Since living and working in France where personal cartes de visite were the norm, I've loved continuing the tradition. I'd really love to win this! I've been working on a design for cards to hand out at my senior interior design show! That is so cute. Hope it works out. Thanks!! The featured cards are adorable! I'd love to win this! Thanks! great timing - i just ran out of business cards! great giveaway. :)congrats on eloise! oh - such a cool giveaway - those look amazing too! These are beautiful! I would love a set! This would be fabulous for my newly graduated self! Just opened my own Etsy shop and would LOVE to have some cute business cards! I'm linking too!!! These would be perfect for all my upcoming craft shows!! oh my goodness! i love your blog and it inspired me to start my own too. Definately in the market for business cards! Love a good giveaway like this. Thank you. oh yes calling cards are a must have for any artisan!! great giveaway! My husband could really use some new business cards! He just opened his own business after the contract he was with fell through -- right after he and his friend/business partner purchased 500 cards each. These cards are so cool! I hope I can win. I would LOVE to win this - yippee!! ps - congratulations on your lovely little girl! perfect timing! I'm actually looking for a new place to buy business cards, and have been hoping for a recommendation from fine folks like you :) if ever I wished I won a giveaway, this would be it! thanks! I ordered my Christmas (post)cards from them. I'd love business cards! Oh I'd love my own business cards. What a great giveaway! Thanks! Oh man, I was just getting ready to BUY business cards from OvernightPrints.com. This is awesome! Good luck to everyone! these are great. i have "mom" cards to leave when i drop off a kid but not this cool! Awesome cards! I would love to win! What a great give-away! Thank you for the opportunity. Oh wow, my first time on your site and I find such a lovely giveaway too. Thanks for the chance! Awesome, I was just in need of some business cards! I twittered about it too. Please count me in! I'd like to make some "Mommy calling cards" since now it seems I'm only refered to as "Laren's Mom" or "Regan's Mommy" ! Thanks for the opportunity, and congrats on the new addition-- she's beautiful. What a great giveaway! I'd love a chance to win some business cards! Gosh...I may be too late...but I'd love to participate!! Thanks for the great giveaways. And congrats on the little one!! I just started a little business and this would be heaven-sent! I could definitely use these! I usually go with vistaprint, but these look a lot cuter. Hmm! For quite awhile I've wanted my own "business" cards. I guess I should say calling cards for me, since I don't have a business quite yet...I'll be dreaming up some designs.... Thanks! wow, The design looks simply superb. thanks for sharing such a beautiful Business Card. The round edges are really nice. This would make a perfect gift for a special someone I know. I hope I win! I have posted this giveaway on my blog also. Thank you. I love the idea of a "mom's card"! Thanks for another awesome giveaway! I added a link to my blog too! I think providing free business cards is just for increaseing costumers. If your company providing free business cards so please tel me why your company providing free business cards????? business card is a way to promote identity and giveaway your information from one and another and from generation to generation. Clear business cards i wanted to change the style . i like your cards . This is really impressive business cards idea...it will useful for me..!!!! Hi as i was reading this site all the sites are premium but cool. I think this is batter to provide a source for free of cost such as peoples can get there free letterhead template at save word templates they are good but no one is talking about them...?? ?